Business today is global - and success requires a new set of skills. But not to worry, whether you're negotiating with vendors in Asia, exploring potential markets in Africa, or leading a diverse team at home, you don't have to master the nuances of every culture you encounter. With Cultural Intelligence, or CQ, you can lead effectively in any context. 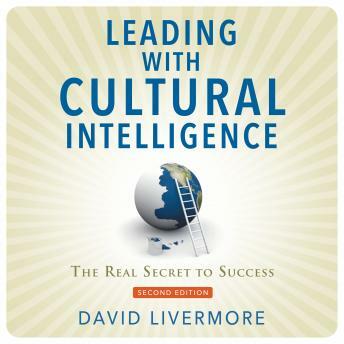 Featuring fresh research, case studies, and statistics on the ROI of improving your CQ, this new edition of Leading with Cultural Intelligence details a powerful, four-step model for becoming more adept at managing across cultures: drive - boost your motivation for and confidence in interacting with other cultures; knowledge - understand the relevance of differences in religion, values, norms, and languages; strategy - plan ahead for unfamiliar cultural settings, but remain flexible if actual experience differs from expectations; and action - successfully adapt your behavior to each situation. With Leading with Cultural Intelligence as your guide, you'll be able to thrive in any business environment - whether it's across the world or in your own backyard.